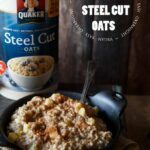 Combine steel cut oats, chia seeds, ground flaxseed, almond milk, water, and a big pinch of salt in a medium saucepan. Bring to a boil and let cook for 1 minutes. Remove from heat and go to bed. Allow to sit overnight (8 to 12 hours). In the morning, stir in brown rice syrup, apple, and cinnamon. Reheat over medium heat for 10 minutes, stirring occasionally. If sweeter taste is desired, add a little more brown rice syrup. Leftovers can be stored in the refrigerator for up to 1 week. It will thicken as it sits in the fridge, so feel free to add a little bit of liquid when reheating if desired. You can also buy whole flaxseed and then use a spice grinder to make it into a powder.